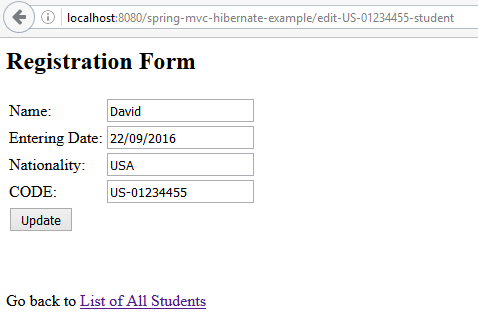 Spring MVC Hibernate Mysql integration CRUD example tutorial show you how to integrate Spring with Hibernate and Mysql using annotation based configuration. We will create a simple CRUD web application that permits us input user data on form and save that data in MySQL database using Hibernate, all using annotation configuration. Let’s begin step by step with the Spring MVC Hibernate Mysql integration CRUD example tutorial. Second thing, we will use JSR303 Validation to validate the user input. You can refer to the complete Spring MVC Form Validation Annotation Example post to get more detail. Third thing, we need to include JSP/Servlet/Jstl dependencies to use servlet api’s and jstl view in source code. But we can set the scope as ‘provided’ for them in pom.xml because containers might already support these libraries. The rest thing, we don’t forget Spring, Hibernate and Joda-Time dependencies. @Configuration marked this class contains bean methods annotated with @Bean producing beans manageable by spring container. In this case, this class takes care hibernate configuration. @ComponentScan is equivalent to the declaration context:component-scan base-package=”…” in xml, it indicates where spring looks for beans or classes. @EnableTransactionManagement is equivalent to the declaration Spring’s tx:* XML namespace and enable Spring’s annotation-driven transaction management capability. @PropertySource is used to declare a set of properties so we can configure different values in different application environments. Once the SessionFactory is created, it will be injected into Bean method transactionManager which enable the support of transaction management. Below is the properties file used in the above code snippet. 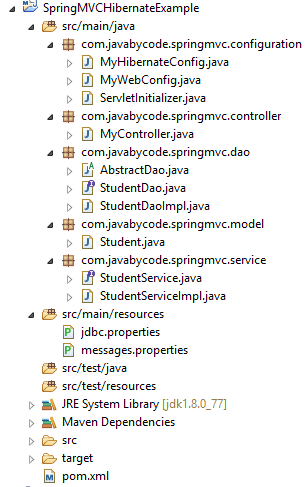 This Spring MVC configuration part was introduced in the previous tutorial, you can refer to the post Spring MVC Annotation Example. So i don’t mention it here. You can also look into the MyWebConfig class in the attachment source code. In this post, we are working with form submission and validating user input. The “messages” properties file is used to contain messages form warning user. 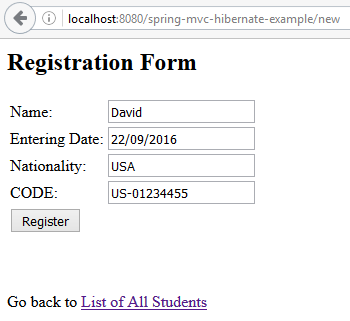 We have a tutorial for this topic, you can refer to the post Spring MVC Form Validation Annotation Example. You can also look into the messages.properties file in attached source code. This Configure the Dispatcher Servlet part was introduced in the previous tutorial, you can refer to the post Spring MVC Annotation Example. So i don’t mention it here. You can also look into the ServletInitializer class in the attached source code. Add the controller which will serve the GET and POST request. * List all existing Students. * Add a new Student. * Handling POST request for validating the user input and saving Student in database. * Provide the existing Student for updating. * Handling POST request for validating the user input and updating Student in database. * Delete an Student by it's CODE value. @Controller annotation marked this MyController class is a controller that handle the requests with pattern ‘/’ mapped by @RequestMapping. Method newStudent handle the GET request for the new student registration page. Method saveStudent will handle the form-submission POST requests – pattern ‘/new’ for new student registration. @Valid asks spring framework to validate the associated object(Student) following the JSR303 Validation standard. BindingResult receives the outcome of this validation and any error that might have occurred during this validation. In case of validation failure, error messages will be shown. Method editStudent brings you to the registration page that is filled up student details, while updateStudent will be invoked when you click on update button. Method deleteStudent takes care the deletion of an student by CODE. Notice @PathVariable, which bind its parameter to variable in URI template. The above stuffs are all we need to do for Annotation based configuration. We will add layer, dao layer, views, domain object, database schema and run the application. This AbstractDao class is the base class for all DAO implementation classes. It provides the wrapper methods for common hibernate operations. Here, we are injecting the SessionFactory that is mentioned in above. The above is a standard Entity class annotated with JPA annotations @Entity, @Table, @Column. One more, hibernate specific annotation @Type are using to map between database date type and Joda-Time LocalDate. @DateTimeFormat is a specific annotation which indicates that a field should be formatted as a date time with a give format. If MySQL installation is a problem with you, you can search MySQL installation on Local PC on google or download XAMPP that is just packaged with Mysql. Then click the Register button to insert student data into database. Back to the “List of All Students” screen, we see that student. Change the entering date and nationality of student and click the update button. Beside, we can delete a student by clicking its delete link. 1. On your Eclipse IDE, go into Window > Preferences > Java > Installed JREs > and check your installed JREs. You should have an entry with a JDK there.